Kyle Russell Sullivan is an American actor, known for appearing on the TV series All That and the Fox sitcom The War at Home. Sullivan served as the recurring character Dabney Hooper on Malcolm in the Middle from 2000 to 2003. Sullivan has also lent his voice to the characters Danny O'Farrell and Everitt Konquist on the Disney animated series Fillmore! 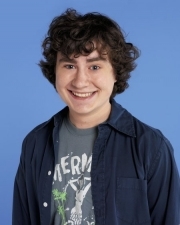 Sullivan has guest starred on television programs such as The Secret World of Alex Mack, The Amanda Show, NewsRadio, Chicago Hope, Mad About You, ER, Scrubs, and Max Keeble's Big Move. Whole or part of the information contained in this card come from the Wikipedia article "Kyle Sullivan", licensed under CC-BY-SA full list of contributors here.